Mannheim, 14.10.2016 - The Röchling Group has completely revised their internet presence and switched it online in a new design. The new site has been created for mobile devices such as smartphones and tablets in Responsive Design. At www.roechling.com the Röchling Group presents the complete range of plastic products and services offered by the world's leading plastics specialist. The new design also takes account of the requirements of mobile devices. The responsive design automatically adapts the presentation of the content to the size of the respective display. The clear, reduced design with Röchling-blue accents supports the intuitive user guidance (usability) and enables an easy orientation within the comprehensive range, which extends over the three divisions. The President and CEO of the Röchling Group, Ludger Bartels, explains: "We want to approach our customers in their respective industry and present our products and services in an even more targeted manner and also optimized for mobile devices." The new Internet presence of the Röchling Group is part of the communication and innovation strategy and should further intensify the direct exchange with the customers and push ahead the internationalization. This is why the new site offers a direct contact possibility and also a link to the contact data of all international locations on each page. The homepage of the new website leads directly into three business divisions Industrial, Automotive and Medical as well as to the new career portal. In addition to the comprehensive range of products and materials, the Industrial Division is now also presenting a navigation point "Industries". Here, Röchling presents to distributors and end-users (OEM) their competence in the respective industry, for example in the chemical, automotive, electrical, or sports and leisure industries. Examples of typical applications and proven products are shown. Röchling Automotive will be presenting its expertise in aerodynamics, powertrain and new mobility on the new webpages. New, appealing graphics have been developed for the five product lines. The new Medical Division, which was founded at the beginning of 2016, presents the products of the various sites for the first time with the relaunch. Here, prospective customers from the industries of pharmacy, diagnostics and life science will find information on the wide range of order-processing services, including primary packaging and complex precision assemblies. The career portal provides information on the initial and further development possibilities at Röchling. It provides information for professionals, graduates, students and pupils, as well as open positions at almost 80 locations worldwide. 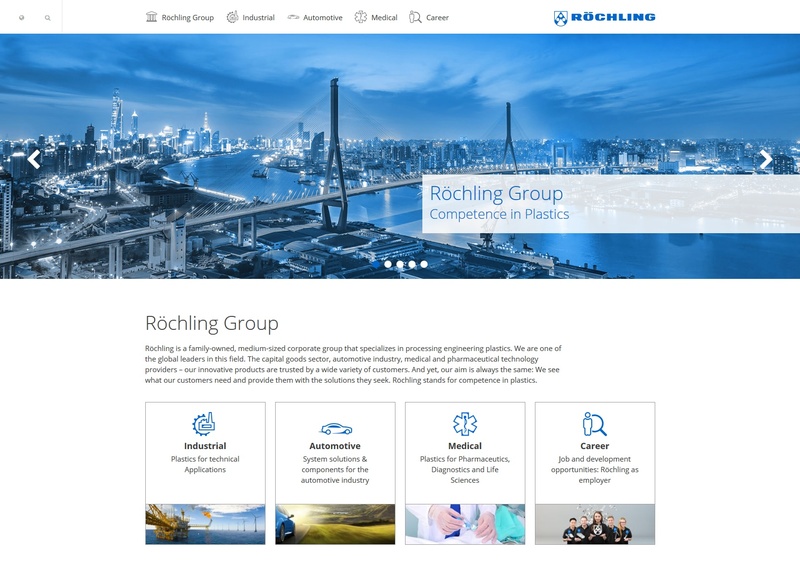 Clear Design: The Homepage of the new Röchling Group website.